Wild animals hunted may be consumed, sold locally or transported to urban markets where they fetch higher prices. Factors which determine which species are sold or consumed include the size of the animal, cultural inhibitions as well as personal or public appeal and demand. Table 3.4 gives the proportion of animal groups sold or consumed in a study of hunters' quarry in northeastern Gabon (Lahm, 1993). Rodents and other small-sized mammals were more likely to be consumed locally while the more appealing and profitable game were sold. Similar practices have been reported in Zaire where 77.5 % of ungulates killed by hunters were sold whereas 55.1 % rodents and 57.1 % of primates were eaten .n villages (Colyn et al., 1987). The general trend in the past was for smaller species to be consumed locally while larger animals were sold. This trend however, is changing as a result of a combination of factors including increased demand, scarcity and the need for cash. Hence, species like pangolins, reptiles and rodents which were in the past consumed by the hunters' households or even only by children now find their way into the market. Apart from countries such as Kenya and South Africa where game hunting is strictly controlled, bushmeat markets exist in many urban and rural markets throughout Africa. Bushmeat marketing is particularly well developed in West Africa and it is also the area where the trade has been well documented (see e.g. Asibey, 1977; Jeffery, 1977; Martin, 1983; Ntiamoa-Baidu, 1987). Bushmeat is an expensive meat throughout the region and in many areas it is more expensive than meat of domestic animals. A number of bushmeat market centres in Ghana, notably the Kantamanto market in Accra and the Atwemonom market in Kumasi, have been studied for varying periods since the 1970's (see e.g. Asibey, 1977, Ntiamoa-Baidu, 1987, Falconer, 1992; Tutu et al., 1993). In Kumasi Ghana, a well organised bushmeat trade provides the main source of income to a chain of bushmeat traders (mainly women) involving wholesalers and retailers (Falconer, 1992; Tutu e' al. 1993). The bushmeat trade at the Atwemonom market is highly organised as small family businesses passed on from one generation to the next and fourth generation traders, i.e., traders whose mothers, grandmothers and great grandmothers had been bushmeat traders can be found (see Box 7). The name "Atwomonom" (Atwe = plural for duiker; mono = fresh) means a place for fresh duiker meat in the Akan language. Between 1971 and 1986, a yearly average of 68,797 kg (range 19,750 to 105,003 kg) of fresh bushmeat carcasses from 10-25 different wild animal species was recorded in the Kantamanto market (Table 3.5). More recent data on volume of fresh and smoked bushmeat coming into bushmeat markets in Kumasi are given in Table 3.6. A total of 13,884.6 kg of bushmeat valued at ¢9,251,759* were recorded over a 27-day period in 1991. This comprised of 3.6,32 animal carcasses belonging to 31 species. The total weights recorded in all cases were reported to be minimal because either; a) the recorders were not at the market on all days or throughout any particular day; b) often, some traders refused to allow records to be taken on their animals, or c) weights of some of the smoked meat recorded were not available. **US $1.02 in 1971 ¢1.00; US$1equiv ¢60 in 1986. Kumasi (over a period of 27 days between April and June 1990) (Source Falconer, 1992). * Market Centres: Atwemonom, Central Market and Kejetia Lorry Park. ** Includes both fresh and smoked meat. Records minimal because some weights were missing for the smoked meat. Kumasi has three main bushmeat market centres, Atwemonom, Kejetia and Central market. The Atwemonom market has a very well organised bushmeat trade and was the main outlet for fresh bushmeat in Kumasi while most of the smoked bushmeat came to the Central market. 100-150 animal carcasses are processed at the Atwemonom market each day of the open season (the period 1st August to 1st December is close season for exploitation of most wild animal species in Ghana). The Bushmeat trade in this market has been monitored for varying periods of time since the 1970s. The trade is dominated by women, both the wholesalers who were supplied directly by the hunters and the retailers who purchased from the wholesalers for retail to consumers were mostly women. The few men encountered in the trade were chop bar operators who also bought their meat from the wholesalers. In contrast, l all the hunters who supplied the meat to the market were men. The women wholesalers controlled both the hunters' prices and the retails prices. Each wholesaler had a group of hunters who supplied her with meat regularly. The women often pre-financed the hunters who were then obliged to repay with meat and also provided credit facilities to the retailers. Through this system, the wholesaler was assured of regular supplies and market for her meat. The hunters or their emissaries normally brought the carcasses to the women wholesalers at the market but in the past when communal hunting was legal and common, the women would follow the hunters on week-end communal hunting expeditions to purchase the quarry in the bush. If a hunter brought meat to the market, the cost of transportation was borne by the wholesaler. The carcasses were then sold whole to the retailers and chop bar operators, who then paid for the dressing and then cut them up into small pieces for retailing/cooking. Occasionally, individuals were allowed to purchase smaller animals, e.g. size of maxwell duiker and below, direct from the wholesaler for home consumption? but normally theft channel would be from the hunter to the wholesaler to the retailer before the consumer. Any carcasses which were not bought on any day were frozen to be sold the next day or smoked to be sold to smoked bushmeat traders at the Central market. One aspect of the bushmeat trade which was dominated by men was the dressing of the meat. At Atwemonom market, all the carcasses purchased were dressed at a central point by a group of men who specialised in that job. Dressing involved removal of the pelage (normally by burning), cleaning and removal of the entrails. The fee charged for dressing of the carcasses varied according to the species and whether it was purchased by a regular retailer or an individual for home consumption and ranged from 400-800 Cedis for a Bushbuck; 200-500 Cedis for a Black duiker and 200 Cedis for Maxwell duiker, grasscutter brush tailed porcupine and other small animals in 1993. Carcasses purchased by individuals attracted 100-200 Cedis extra for dressing. The Kumasi bushmeat trade illustrates the multiplier effect of income from hunting and employment from wildlife-based industries. The business was handed down from generation to generation and two or three generations of bushmeat traders were common. The trade provided the main source of livelihood for the traders and their families and several of the traders operated as family groups with one woman as the head, assisted by her children and grand children. In 1993, an attempt was made to obtain a more complete picture of the volume of bushmeat trade passing through the Kantamanto market and the Atwemonom markets. Observers were stationed at the markets from dawn to dusk every day over a one week period in March and May to record the species, weights, purchase and retail prices of every animal coming to the markets. A total of 1276 carcasses weighing approx. 9,470 kg were recorded at the Kantamanto (742) and the Atwemonom (534) markets. These were purchased from the hunters at a total price of ¢3,177,164.00 and ¢2,891,250.00 at the two markets respectively (Tables 3.7 and 3.8). 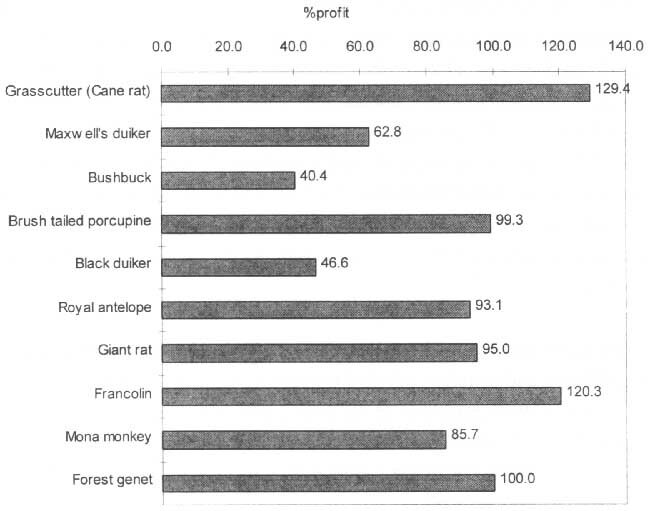 Analysis of the data showed that the profit margin of the Kumasi bushmeat traders ranged from 30 to 250% depending on the species and size of animal involved (Fig. 4).  there had been very little change in the overall level of exploitation. This would suggest that although the populations of most wild animal species are believed to be declining in the West African sub-region, hunters continue to put sufficient effort into hunting to maintain supply levels and satisfy the ever growing demand for bushmeat.